From whence comes the Quran-"Holy books have a history"
In the following video presentation, Dr. Andy Bannister presents a compelling analysis of the origins of the Quran which challenges the standard popular model that states that Mohammad borrowed or did a bit of ‘cut & paste’ from the Taurat and the New Testament Gospels/Injil, as well as other sources such as, the heretical Christian and Jewish sects that lived in Arabia at that time. Highlighting the Quranic story of Iblis and Adam (Sura 7:11-18) which appears seven times in the Qur’an, each time as a different version of the story, Dr. Bannister makes the case that Mohammad wasn’t a cut and paste plagiarist, as has been promoted by popular scholarship. 1. There really is no textual overlap between the Qur’an and any of these so-called sources. 2. If Mohammad simply copied the story from earlier writings, why is every time that the story of Iblis and Adam, for instance, that as it occurs in the Quran, is told differently? Not only is every telling of the Iblis and Adam story different from the Jewish and Christian tellings, each story is different from the other versions in the Qur’an. It is very hard to see how that could be the case if Mohammad was simply copying and pasting uncritically. 3. The idea that Mohammad copied ‘scissor and paste’ style, for much of the material found in the Qur’an, assumes that written copies of these stories were circulating in the Arabia of his day. It assumes that Mohammad or a scribe, perhaps working for him, had access to the Jewish Talmud, ideally in Arabic, or the Old Testament in Arabic, and so on and so forth. But to the best of our knowledge, as scholars, those documents were not available in Arabic and had not been translated into Arabic by the time of Mohammad. 1. It shows that the Quran has a history. It puts the Qur’an into context-the Qur’an did not drop from heaven fully formed. 2. The Qur’an has human finger prints all over it. They are very oral finger prints, but they are finger prints nevertheless. 3. Mohammad used oral tools to construct the Qur’an-and those tools that he used, performance variance, formulaic language, highly illusive referencing have left their mark on the text. Dr. Bannister also refutes the Muslim claim that the Qur’an is a miracle because Mohammad was unread and illiterate. He states, “Claims that Mohammad’s illiteracy mean the Qur’an is a miracle fail to appreciate that we have examples of hundreds of other cultures around the world that don’t have writing that have been able in history to produce amazing works of literature. It assumes that oral cultures are primitive and that is not the case at all.” He goes on to give a number of examples of such cultures. 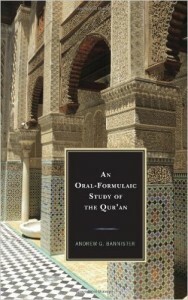 The above video presentation is based on Dr. Bannister’s mile-stone book, An Oral-Formulaic Study of the Qur’an. Dr. Bannister is an adjunct research fellow at the Centre for the Study of Islam and Other Faiths, Melbourne School of Theology, and visiting lecturer at the Centre for Islamic Studies and Muslim-Christian Relations, London School of Theology, along with also serving as the Canadian director and apologist for Ravi Zacharias International Ministries in Toronto, Ontario. The Qur’an makes extensive use of older religious material, stories, and traditions that pre-date the origins of Islam, and there has long been a fierce debate about how this material found its way into the Qur’an. This unique book argues that this debate has largely been characterized by a failure to fully appreciate the Qur’an as a predominately oral product. Using innovative computerized linguistic analysis, this study demonstrates that the Qur’an displays many of the signs of oral composition that have been found in other traditional literature. When one then combines these computerized results with other clues to the Qur’an’s origins (such as the demonstrably oral culture that both pre-dated and preceded the Qur’an, as well as the “folk memory” in the Islamic tradition that Muhammad was an oral performer) these multiple lines of evidence converge and point to the conclusion that large portions of the Qur’an need to be understood as being constructed live, in oral performance. Combining historical, linguistic, and statistical analysis, much of it made possible for the first time due to new computerized tools developed specifically for this book, Bannister argues that the implications of orality have long been overlooked in studies of the Qur’an. By relocating the Islamic scripture firmly back into an oral context, one gains both a fresh appreciation of the Qur’an on its own terms, as well as a fresh understanding of how Muhammad used early religious traditions, retelling old tales afresh for a new audience.